Home » Blog » History » What Is Wheated Bourbon? By law, Bourbon must be made from a mash of at least 51% corn. But what makes up the other 49%? Let’s find out. Bourbon must be made in America from grains. This requirement differs from some foreign whiskies. For example Indian distillers often use fermented molasses in place of grain. But here in the USA any spirit labeled “Whiskey” must be made from a grain mash. Bourbon takes this a step further and requires at least 51% corn in the mashbill. The mashbill is the recipe, or combination of grains, milled and combined as the starting point for Bourbon. 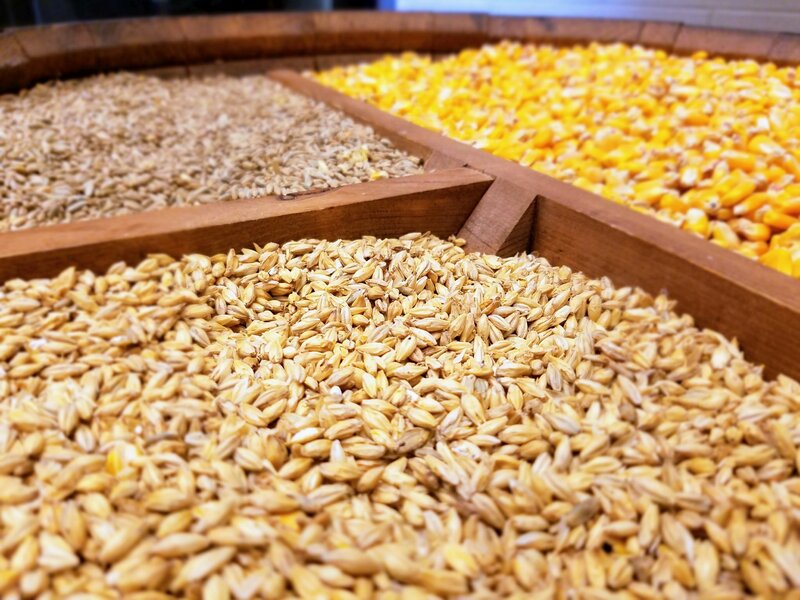 Corn, Rye, and Malted Barley laid out at Wild Turkey. Besides corn, the other grains used in a Bourbon mash are called “flavor grains”. Of course corn does impart flavor in Bourbon, and Bourbon can be made from 100% corn. Some distillers, particularly farm distillers, put great stock in the quality of their corn. But just about every distiller uses a few other grains in the process. Traditionally, the other grains used in a Bourbon mash are rye or wheat. 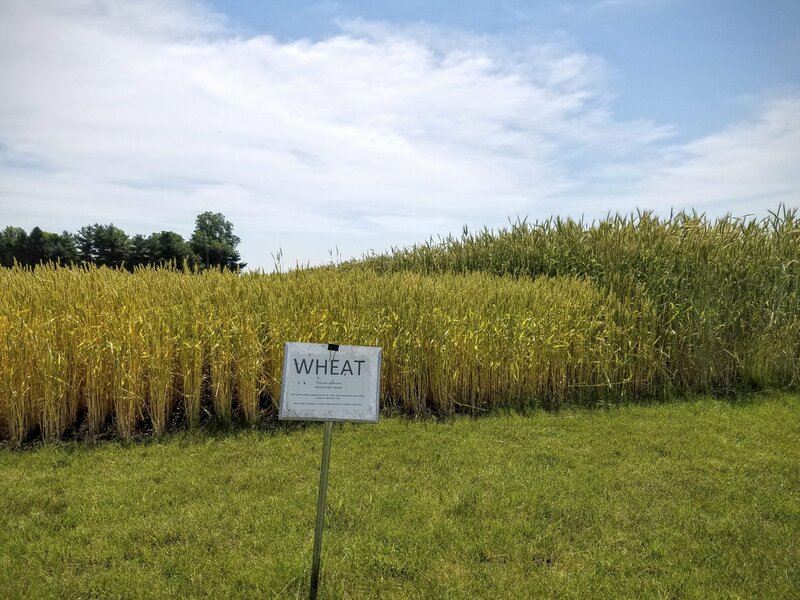 These two flavor grains were abundant on the frontier, rye in the colder climates of the north and east, wheat in the midwest states. Rye was first used to make rye whiskey and Bourbon as settlers moved into the eastern seaboard. Later, as these settlers moved west, wheat was adopted as it was more abundant in what are now our midwestern states. Those defining points in American history give us the recipes used by the vast majority of distillers to this day. A wheat field at Whiskey Acres Farm Distillery. Why might today’s distiller choose to use rye or wheat in a mashbill? And what’s the difference? Two defining characteristics come into play. The flavor profiles of rye vs wheat and how a distillate made from each grain ages as it interacts with the inside of a charred oak barrel. I often describe the different flavors of rye and wheat by comparing them to the breads made from each grain. Rye bread is a bit sharp, almost spicy, strong, and dark. Bread made from wheat is lighter in weight, color, and flavor with a bit of sweetness. Bourbon made from each grain is often similar in color, flavor, and finish. Whiskey made from rye tends to “age faster” in a barrel compared to its wheated counterpart. We won’t get into organic chemistry here but understand that certain compounds present in rye whiskey tend to interact with certain wood compounds at an accelerated rate. Once a distiller chooses rye or wheat their job isn’t done. Next they have to decide how much corn, rye, and/or wheat they will use. Different amounts of these grains make mashbills unique. 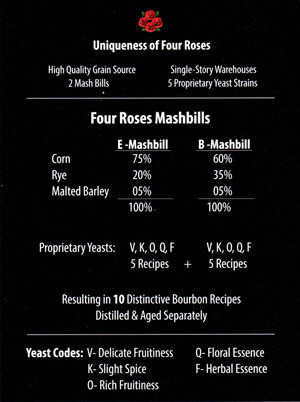 Four Roses makes Bourbon from two different rye mashbills. Their “E-Mashbill” 75% corn, 20% rye, and 5% malted barley. And the “B-Mashbill” 60% corn, 35% rye, and 5% malted barley. Each of these mashbills is further combined with 5 different yeast strains to make up the 10 Four Roses recipes used today. Each recipe, proportion of rye to the other grains, and different yeasts, create unique flavors making each of their Bourbons different. Wheat is the grain of choice for Maker’s Mark. They’ve been using wheat in their Bourbon mashbill since production began in 1954 and the first red wax dipped bottle hit shelves in 1958. 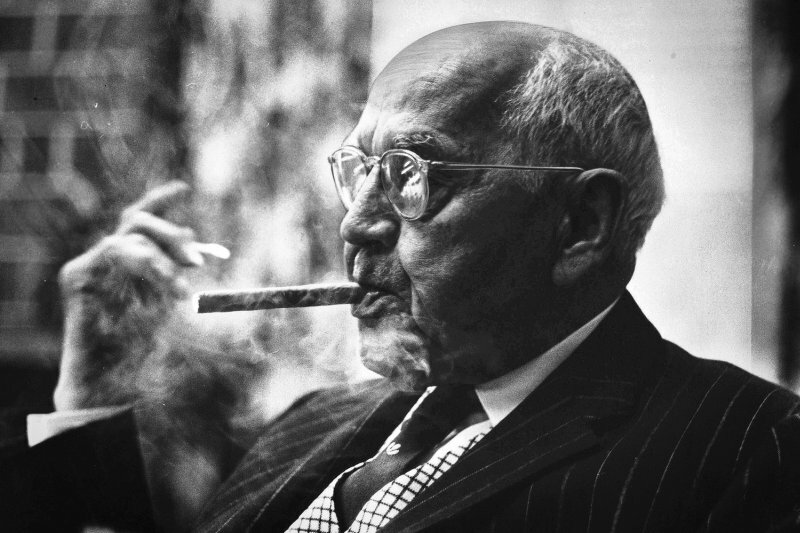 Founder of Maker’s Mark, Bill Samuels Sr., was inspired to use wheat in his Bourbon by experimenting with bread baking using different grains. Wheat bread proved the most agreeable to Samuels. He also received guidance from another Bourbon legend, Julian Van Winkle. Before Maker’s Mark came into existence; Julian “Pappy” Van Winkle made wheated Bourbons under the brands Old Fitzgerald and W.L. Weller. Two brands still available today, though now under different ownership and distilled at different distilleries. The latest notable entry i’ve tasted to the wheated Bourbon space comes from a producer historically known for their rye whiskey. 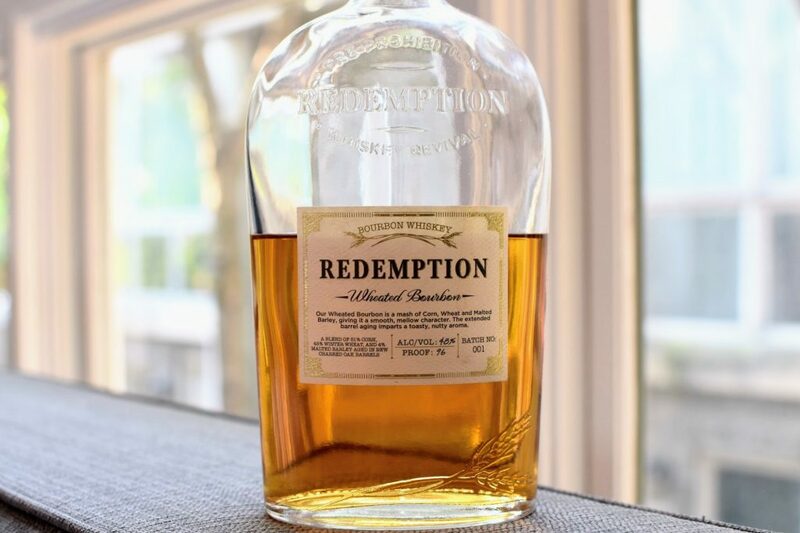 Redemption Whiskey has just released Redemption Wheated Bourbon, pictured below. This Bourbon is unique in the wheated space with a “high wheat” mashbill of 51% corn, 45% winter wheat, and 4% malted barley. This is the highest wheat content i’ve ever tried in a Bourbon; falling just a few percent this side of being considered a wheat whiskey such as Heaven Hill’s Bernheim Original Wheat Whiskey or their Parker’s Heritage. For comparison, the original Maker’s Mark comes in at just 16% wheat. Aged 4 years and bottled at 96 proof Redemption Wheated Bourbon, Batch No. 001, looks to me like it will hold its own against these incumbents and help pave the way for what one Chicago bar manager told me is now the most asked for category of whiskey in his bar, wheated Bourbon. What if one grain just isn’t enough?! Some distillers use both rye and wheat in the same mashbill or in different mashes they produce. Buffalo Trace Distillery keeps their mashbills a secret and enterprising fans have put together their best estimates. Two mashbills use varying amounts of rye grain while the third uses wheat. 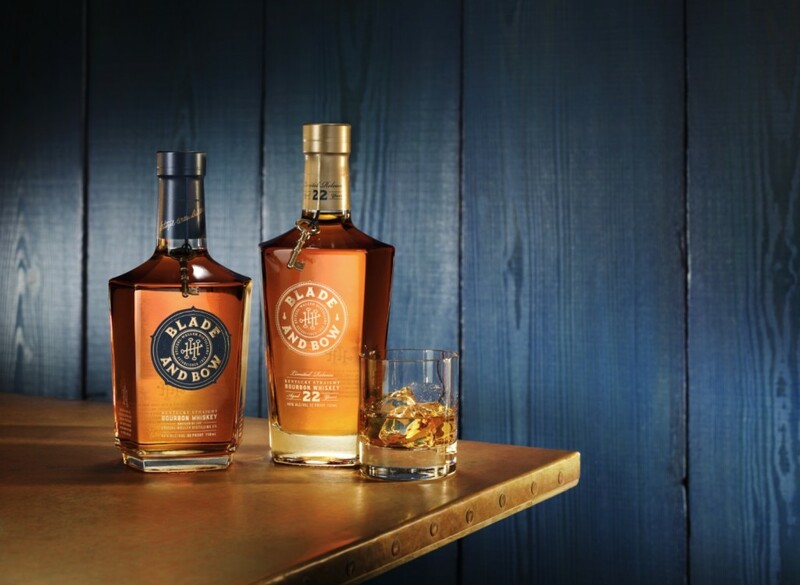 Buffalo Trace’s rye mash produces Buffalo Trace Bourbon, Eagle Rare, and Blanton’s to name just a few. While the wheat mashbill puts out the W.L. Weller lineup and the infamous Old Rip and Pappy Van Winkle Bourbons. Earlier this year they released E.H. Taylor Jr., “Four Grain” made with, you guessed it, both rye and wheat (along with corn and malted barley). This 100 proof Bourbon retails for about $70 but you’re more likely to pay upwards of $200 if you can find it. Old Rip Van Winkle 10 year poured at the 2017 Chicago WhiskyFest. What about other grains? A few adventurous distillers forego rye and wheat, instead using other grains such as quinoa, millet, or oats. Chicago’s KOVAL Distillery makes whiskey from all of those grains. 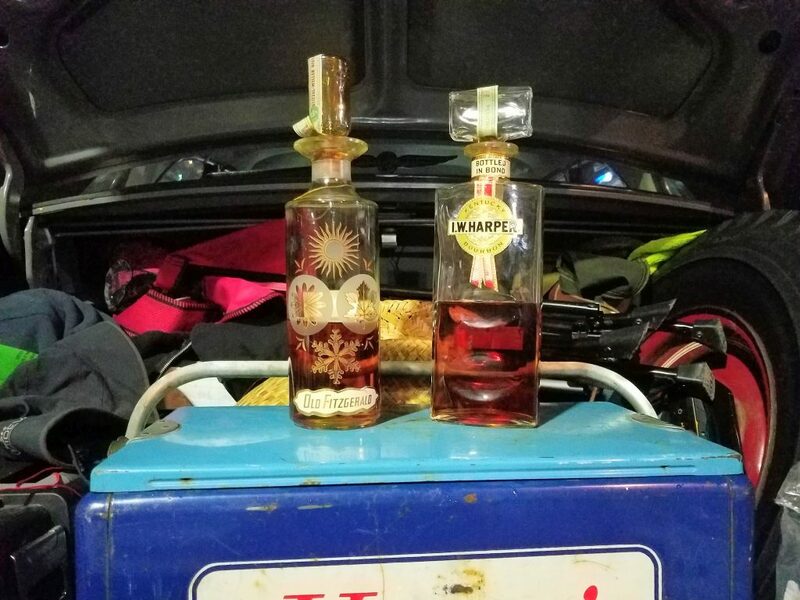 Corsair has their “Oatrage” whiskey. And Jim Beam toyed with a limited release Bourbon using a grain you’ve probably never heard of, Triticale. Corn is the only grain required by law. The other grains in a Bourbon mashbill are completely up to the distiller. The final, and usually smallest, portion of a Bourbon mashbill is malted barley. The barley typically makes up a single digit percentage of the recipe but plays a very important role. It enables the conversion the grains starches into sugar. Yeast added during the fermentation process eats these sugars, turning them into alcohol. While Bourbon utilizes a small amount of barley Scotch, by definition, is made exclusively from it. While wheated Bourbons are a smaller category than rye Bourbons their popularity is growing. As someone who’s first Bourbon was a wheater it holds a special place on my palate. 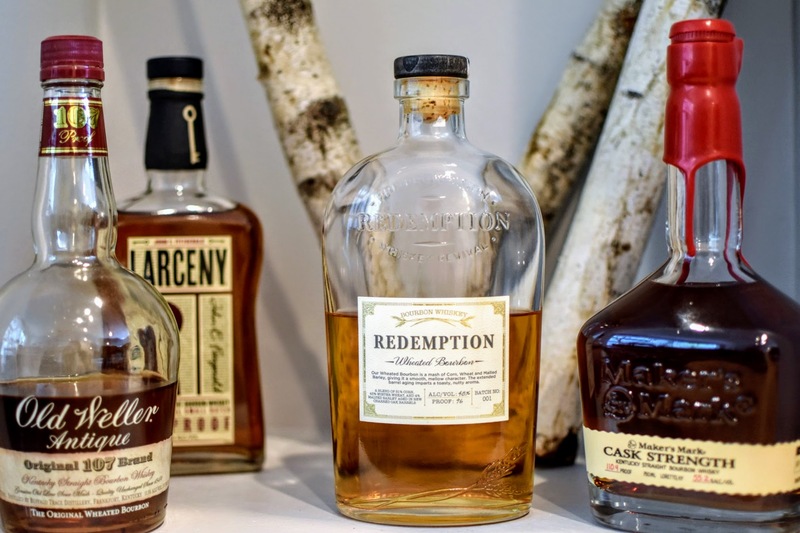 It’s interesting to see some of these higher proof wheated Bourbons coming to market, from Redemption Wheated Bourbon to Maker’s Mark Cask Stregth, and likely others to come. 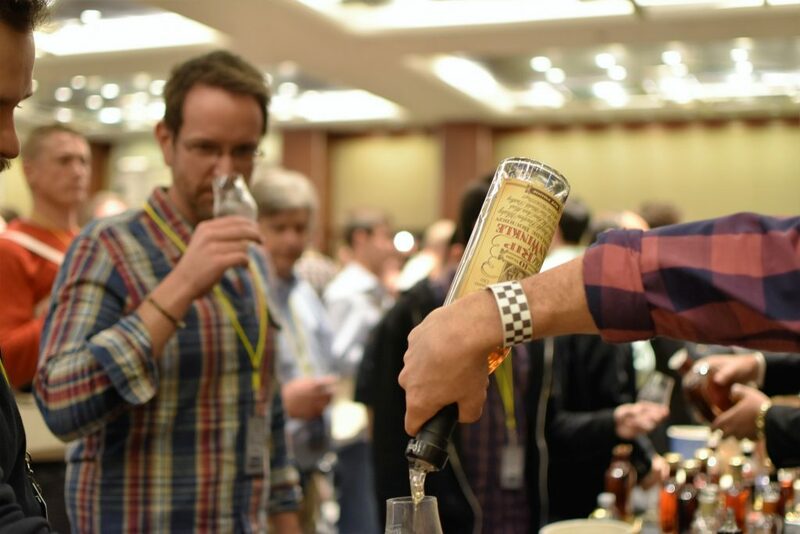 As the Bourbon category as whole continues to grow, us drinkers can expect many exciting varieties vying for a place in our glass.